Synopsis: For a generation John O’Brien & Beth Mount have accompanied people with developmental disabilities, their families and the partners who support them as they find diverse paths to social inclusion and self direction. These pathfinders’ journeys change organizations and build communities that work better for everyone. • Our common purpose as citizens is to contribute, each in our own way, to building communities that work better for everybody. • A community that works better for everybody is a place where citizens offer one another opportunities to create real wealth: positive relationships, diverse networks, useful assets, capacities for contribution and resourcefulness. Prejudice and discrim-ination put people with developmental disabilities at risk of exclusion from these opportunities. • Social inclusion is the result of a hero’s journey. It involves courageous and creative pathfinding led by people with developmental disabilities who want a better life. Encouraging this leadership calls for cultivating deep listening that generates creative action. • Good services develop and support partnerships with people and their families and allies. They find better and better was to make it easier for people to take self-directed journeys to inclusion. Partnership with people most likely to be seen as “too disabled” to contribute is a hallmark of good services. • Pathfinders and their partners are social inventors. They break out of old stories and structures and design new ways for people to contribute. All books below are by Beth Mount unless otherwise noted. With Sandy VanEck. Keys to Life: Creating Customized Homes for People with Disabilities Using Individualized Supports. ARC of Rensselaer County, 2011. With John O’Brien. Make a Difference: A Guidebook for Person Centered Direct Support. Inclusion Press. Inclusion Press, 2005. With John O’Brien. Leader’s Manual for Make a Difference: A Guidebook for Person Centered Direct Support. Inclusion Press, 2005. —Person-Centered Planning: Finding Directions for Change Using Personal Futures Planning: A Sourcebook of Values, Ideals, and Methods to Encourage Person-Centered Development. Capacity Works. 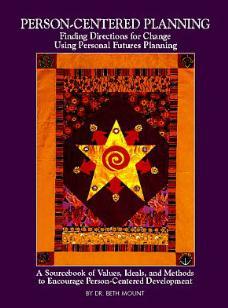 —Life Building: Opening Windows to Change Using Personal Futures Planning Personal Workbook. Capacity Works. With Connie Lyle O'Brien. Building New Worlds: A Sourcebook for Students in Transition from High School to Adult Life. Capacity Works.